A lot of ranchers use some kind of grazing rotation. Very few do it in a way that has even a 50/50 chance of improving the health of the land, the performance of their cattle and the profitability of their businesses. There are so many names attached to various rotations, it is hard to know from the name what people are doing. Cell grazing is not a grazing system, it is a management method based on 5 fundamental principles. You are using at least 10 paddocks per herd. It takes a minimum of 10 paddocks just to stop the overgrazing. 14-16 are required to support decent animal performance and it’ll take 25 or more if you want to see rapid range improvement. Ranchers using fewer than 8 paddocks are not rotationally grazing. They are rotationally overgrazing. You have combined several herds into one. The fastest, cheapest way to create more paddocks per herd is to combine multiple herds into one. You have reduced your workload. It takes a lot more time to check 4 herds of 200 cows than it does to check one herd of 800. Productivity per acre has improved without sacrificing individual animal performance. Many people using grazing rotations increase output per acre but find that individual performance suffers. Cell graziers keep graze periods short and animals moving frequently to fresh forage. This tends to keep performance high. 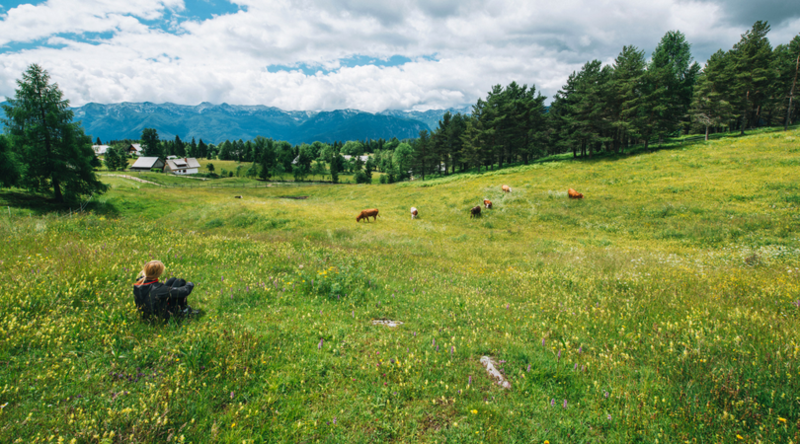 You’ve dramatically increased the productivity of your pastures and the carrying capacity of your ranch without seeding or fertilizing pastures. Many Ranching for Profit School alumni have doubled the carrying capacity of their ranches while reducing labor and input costs. Someone asks you how long your recovery periods are and you tell them how often you move the cows. I’m continually surprised by the number of people who describe their grazing practices by explaining the length of their graze period when it’s the rest period that is most important. The single biggest mistake most people make in grazing management is providing too short a rest period. You use the same recovery period year round. In cell grazing the recovery period is matched to the growth rate of the pasture. Since growth rates change, the length of recovery periods needs to change too. Slow growth, long recovery. Fast growth, shorter recovery. Animals are moved from one pasture to the next in lock-step fashion. In cell grazing, if a paddock isn’t ready for grazing, the animals should not be moved there. The animals ought to be moved where the resource dictates they go. You have increased your use of herbicides, fertilizer, seeding or fire. These tools aren’t bad per-se, but they can have more negative consequences than positive ones. Cell graziers usually don’t find herbicides, fertilizers or seeding necessary and many have dramatically reduced the need to burn. Responding to a survey we included in last week’s ProfitTips, reader’s answers revealed several important trends. For example, people reporting that carrying capacity increased “A lot” used an average of more than 30 paddocks/herd. Readers reporting “A little” increase used an average of 20 paddocks/herd, and those reporting no increase used an average of 10 paddocks per herd. The same trend held true for improvements in pasture quality, animal performance and profit. While more than 60% of RFP alumni completing the survey use at least 14 paddocks per herd, only 40% of non-alumni use that many. RFP alumni reported that the average recovery they gave paddocks during fast growth was two to four weeks longer than the rest periods used by people who have not attended the RFP school. The difference was even greater during slow growth. The average recovery period used by RFP alumni averaged one to two months longer than the recovery periods used by non-alumni. Most interesting to me is the difference between RFP alumni and non-alumni in the change in workload. RFP Alumni using 30 paddocks or more were four times more likely than non-alumni to report that cell grazing dramatically reduced their workload. Non-alumni using an equal number of paddocks were twice as likely to report a dramatic increase in their workload. The most dramatic decrease in workload was reported by RFP alumni using more than 50 paddocks per herd. Why would the workload decrease for alumni using that many paddocks? The majority had also timed the breeding season of their livestock to match the breeding season of wildlife, thereby drastically reducing or eliminating the need for hay. Fewer non-alumni had the breeding season of their herds in sync with the forage cycle.